​​Following are some reminders of the important "Where's, When's & What's" on Race Day. From the East Valley, take #101 Loop north to Cactus Rd. exit. Go west on Cactus to Tatum Blvd. From the Central Phoenix, take #51 north to Cactus exit. Go east on Cactus to Tatum Blvd. ​From the West Valley, take 101 Loop to #51 south. Exit #51 at Cactus Rd. exit. Go east on Cactus to Tatum Blvd. Paradise Valley Mall is on the northwest corner of Cactus and Tatum Blvd. Click on button below for directions. ​The staging area is located on the northeast side of Paradise Valley Mall adjacent to Dillard's and 46th St.
To ease congestion at the 5K start, (4) waves at one minute intervals will be staged. Waves will be sectioned off with flagging by race staff once participants are in the start pen. Potential overall race winners (men 5:30 per mile, women 6:30 per mile) in both races will be placed in a starting pen at the front of the pack prior to the starts. Where is Race Day Packet Pick-up/Staging Area? : Northeast corner of PV Mall, adjacent to Dillard's and 46th St.
Where do I Park? : There is an abundance of parking all around PV Mall. Park on the northeast side of the mall adjacent to Dillard's and you will be steps to the staging area. ​Is there a Gear check? : No. With the close proximity to parking we encourage you to store your gear in your car. Where are the Rest Rooms located? : Rest Rooms are located at the far east side of the staging area parking lot. Shirt Size Exchanges: Participants will receive the size they requested when registering. Exchanges will be available from remaining inventory, following the 5K start on race day. Excess shirts will be available for purchase at $10 each. If I still have questions. How do I get answers? Go to the "Solutions" tent in the staging area. If it's race related, they'll have the answers. If it's not race related, they'll still give it a shot but no math or organic chemistry questions please. Finisher Medals will be presented just past the Finish line. Double Stack participants will receive their medal upon finishing the 5K Run. Water is available prior to the starts immediately east of Start/finish line in the Staging area. AQUAhydrate, our bottled water sponsor will be available after you finish your race. 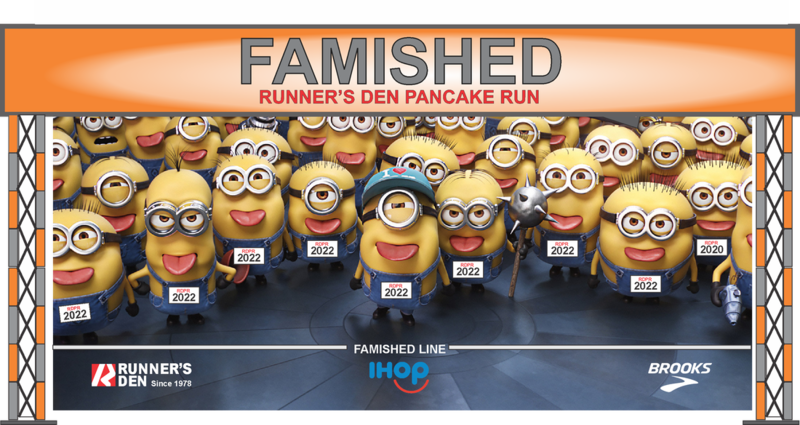 If I'm running the 5K, can I eat my Pancakes before I run? Really? ​Award Medals can be picked up any time after you have seen the results posted on the video boards. There will be no official Awards Ceremony.​ We promised PV Mall we'd be out by dark.